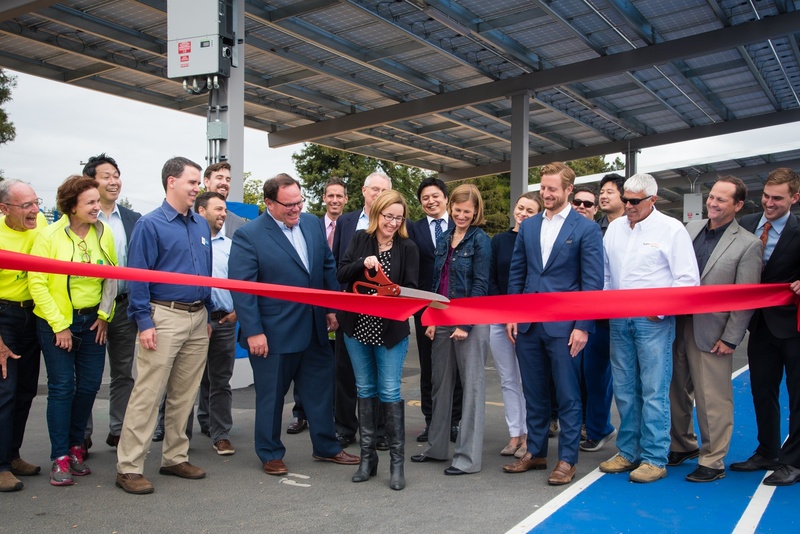 SAN FRANCISCO, CA – May 24, 2018 – ForeFront Power and Los Altos School District (LASD) in California celebrated the completion of solar canopy systems across nine District schools today. The ceremony at Oak Avenue Elementary School also included Sunworks, the primary construction contractor, and TerraVerde Energy, the District’s procurement consultant. The 1.4-megawatt (MW) portfolio is now delivering clean, renewable energy to the schools at a price below their grid rate. LASD is receiving solar energy at no upfront cost and without the use of bond funds using a Power Purchase Agreement (PPA) framework with ForeFront Power. Through a PPA, ForeFront Power is responsible for all project financing, engineering, construction, operations, and maintenance for a 20-year project term. As a result, the solar portfolio is expected to save the District over $175,000 annually and up to $2.7 million within the first ten years of operation. “The Los Altos School District has a history of financial prudence and commitment to providing top-notch education for every single one of our students. The completion of this project immediately begins a cost savings that will contribute to quality education in all of our schools,” said Superintendent, Jeff Baier. Understanding the importance of a stable learning environment, ForeFront Power coordinated closely with LASD to construct and complete the systems during the school year with minimal impact to school activities. ForeFront Power included Data Acquisition Systems (DAS) that integrate with online system performance monitoring software and flat screen televisions that were installed in the front office of each school. All schools will also receive free solar energy lesson plans and curricula through ForeFront Power’s exclusive partnership with Schools Power. These lesson plans promote a technical understanding of solar energy as well as career and college readiness training to prepare the next generation of leaders for solar jobs. These nine solar projects are expected to offset the equivalent of 1,754 tons of carbon dioxide avoidance or 336 cars taken off the road for the first year of production – per the EPA Greenhouse Gas Equivalencies Calculator. Los Altos School District operates seven elementary and two junior high schools and is a top-rated school district in the State of California. LASD serves more than 4,500 K-8 students from portions of Los Altos, Los Altos Hills, Mountain View and Palo Alto. All nine schools in LASD have been recognized as California Distinguished Schools and/or National Blue Ribbon Schools. LASD is nationally recognized as a leader in educational innovation and for its many awards. Read more about LASD programs at iLearn Blogspot and follow on Twitter @lasdk8.